Download Nesta's Creative Enterprise Toolkit in English, Arabic, Mandarin, Portuguese, Russian, Turkish and Vietnamese. 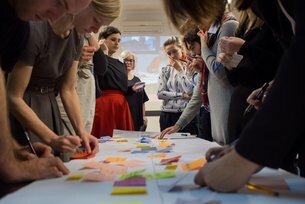 The British Council have been partnering with Nesta to internationalise their Creative Enterprise programme and disseminate their training methodology around the world. These are creative and practical tools which simply, but critically, offer a useful framework for developing, testing and turning business ideas into tangible and long term enterprises. The tools allow the individual to explore and develop their own values, skills, ambitions and confidence, alongside developing their actual idea - this is one of the key USPs compared to other forms of business support. You can download the Toolkit for free in its different language versions from our resrouces page, HERE. Genevieve Pace and Kimberley Ballantyne look at how the Creative Enterprise Programme draws on local expertise to contextualise the workshop content in different countries in a more meaningful way. A new international exchange to share growth strategies from the UK with Kenyan businesses. Creative Business Cup 2014 open for entries!